Panini Kabob Grill, offering a fresh, healthy and high-quality Mediterranean menu is opening at Kaleidoscope in Mission Viejo on Saturday, April 7. The casual family restaurant will serve breakfast, lunch, and dinner daily. 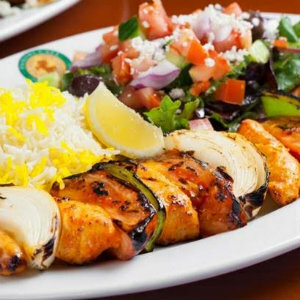 Panini Kabob Grill serves a variety of salads; paninis; wraps; shish kabobs with steak, chicken, lamb, salmon or shrimp; and vegetarian entrees including a falafel platter, charbroiled organic tofu kabobs, and stuffed bell peppers. Family Platters can be ordered for sharing, and a Kids Menu is available to children 12 and under. The restaurant serves breakfast on weekdays until 11 a..m and on weekends until 3 p.m. The menu includes an assortment of eggs, paninis, wraps, french toast and more. Panini serves LaVazza coffee, and soy or almond milk can be substituted in espresso drinks for no extra charge. Guests can also enjoy a selection of sparkling wine, wine and beer with their meals. The restaurant uses only organic eggs, hormone, and antibiotic-free proteins, and uses nothing processed or containing MSG. Panini Kabob Grill makes all items from scratch with fresh fruit, vegetables, herbs, and dairy delivered every morning. Panini Kabob Grill is open daily from 8 a.m. until 9:30 p.m., and offers dine in, take out and catering. 27741 Crown Valley Parkway, Suite 212, in Mission Viejo.949.367.0442 or visit paninikabobgrill.com.